“Whichever place we contest, it will be minister-specific. Not at the personal level but at the policy, ministry level. It’ll be ministry-oriented,” says the National Solidarity Party (NSP). Revealing the party’s General Elections strategy to The Online Citizen, the NSP says that one weakness of the opposition parties in Singapore in battling the ruling People’s Action Party (PAP) in past elections was their lack of focus on specific ministries and their policies. One of the main issues for the next elections which the NSP will be fighting on will be public housing and the costs of HDB flats. Thus, the party intends to question Mr Mah’s housing policies. The NSP’s president, Mr Sebastian Teo, explains why high flats prices do not benefit flat owners. “If they sell it and buy it again, [they’re] going to incur heavy financial costs.” Higher HDB prices is not going to benefit the 80 per cent of Singaporeans who do not own more than one flat or house, he says. It only benefits the 20 per cent who do. “Majority of Singaporeans should know that this is a problem for them, and not those who own more than one house. The 20 per cent will be happy. If I have two houses, I will be happy. [HDB prices] can go up to one million [dollars]. I sell my HDB [flat], I’ll still have my private house.” But for the rest, they cannot re-mortgage their flats to cash out the value. 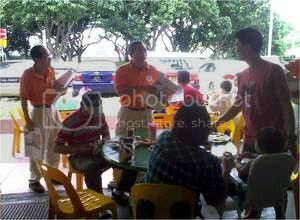 The group of party members was at the Tampines Street 11 wet market and hawker centre on Sunday morning to sell the party’s newspaper, North Star News. Sales was brisk as residents, who were out doing their marketing or having their breakfast, gave their support. “Brother, I see you again,” one resident said to the party’s secretary-general, Mr Ken Sunn, as he was making the rounds at the tables. The NSP, which was founded in 1987, has contested Tampines GRC five times but has never won. Its only presence in Parliament since the party’s creation has been the Non-Constituency MP (NCMP) seat which was given to Mr Steve Chia in 2001. However, this has not deterred the party, which intends to contest three GRCs – Tampines, Jurong, Jalan Besar – and three Single-Member Constituencies – Yio Chu Kang, MacPherson, Nee Soon Central – come the next elections. Party members have been working these areas since the last GE, says Mr Sunn, with their weekly door-to-door visits and visits to the markets and hawker centres. 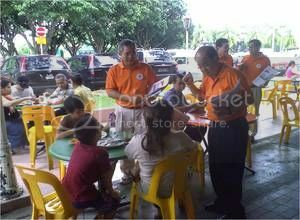 For Mr Goh, he is not interested in contesting any SMCs. Instead his focus is on “break[ing] the fortress of the GRC”. “Only then can you effect change, within the rules,” he explains. “[This is because] the PAP always reacts to changes. The only change we can make is when the fortress fall, they will think of something else.” So, is his Tampines team ready for the elections? “My team is already formed,” he says “but I’m not going to reveal it.” He gives two reasons for his reluctance to reveal more about his team – when the elections will be called and whether Tampines will remain a 5-member GRC or become a 4-member one. PM Lee, in announcing the changes to the political system recently, had said that the sizes of the GRCs will be reduced. Because of these two uncertainties, the NSP does not want to raise the public’s expectations, Mr Goh explains. As the party gears up for the elections, it is working on its manifesto which, Mr Sunn feels, needs to be updated. The party is also in the process of setting up its Youth Wing and recently recruited some new members, including former Workers’ Party candidates in the 2006 elections, Ms Lee Wai Leng and Mr Abdul Salim. The Online Citizen asked the NSP’s sec-gen, who is one of the founding members of the NSP, what he thought of Prime Minister Lee’s performance in the last three years since the 2006 elections. “I think his performance is credible. I find that he has mellowed considerably since taking over [as Prime Minister],” Mr Sunn says. “He is facing the reality [and is] having a difficult time. We sympathise with him. 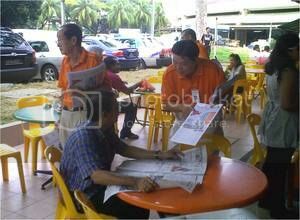 However, the issue of cronyism still comes up once in a while and that is something that [the PAP] has to dispel. We foresee that he will continue to lead the party for one more election, health permitting.